I remember finding a copy of my father’s 637 Best Things Anyone Ever Said by Robert Byrne when I was just entering the workforce and consuming these brainy, and often witty quotes, from people as diverse as Hemmingway, Plato and Einstein. My father used to use these quotes in speeches and talks he’d give to make his audience ponder the wisdom of the wise and famous while he shared the latest business innovation of his firm. This is the premise behind the service we developed for our customer Nimble Quotes. 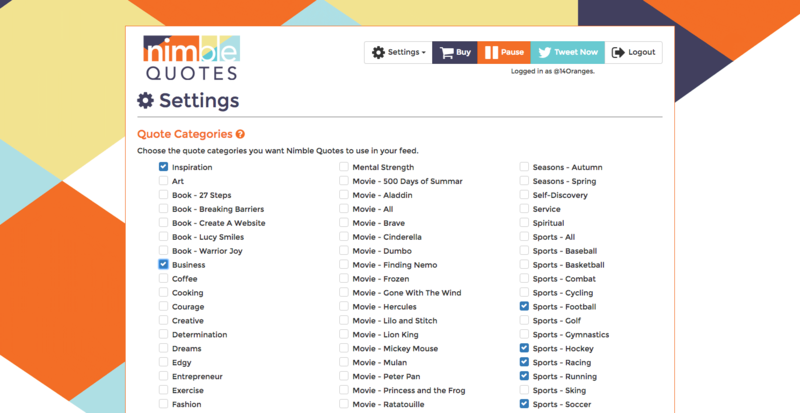 Nimble Quotes is a web service that automatically tweets famous quotes on your behalf on a random or set time interval. It’s based on five very easy setup pages, that allow you to choose the categories of quotes you want to draw from, the hashtags that go along with the quote, and the pictures and colours to go along with your quotes. No need to leaf through thousands of pages of quotes to find that bon mot … Nimble Quotes has them all. It’s a set and forget service! So along with your standard marketing tweets sharing your latest news, you get to add in some quotes from your favorite author or historical figure to add some wise words that can capture the imagination of your followers. That’s because we quote connoisseurs all know … “Imagination is more important than knowledge.” – Albert Einstein. So the FBI wants access to all your iPhone data right..
Well not exactly. Let’s step through it. In tangible terms they are asking a company that makes a fireproof box with a lock on it to build them a tool that would allow them to try to make a copy of the key to that box. They aren’t even asking for the master key but a way to make a key for a specific device by electronically guessing all the possible permutations of the ridges and valleys on that key. What Apple is saying is if we build that device to make a key it will compromise the security of everyone with an iPhone. This just is not accurate in my estimation. The FBI would have a warrant in this case for everything this guy had, including his phone. They just don’t have a way to see the data on the phone. In the case of the fireproof box they could just blow the sucker open. They just need Apple’s help to build the tool. One thing to expand upon at this point that before I wrote this I was unaware of. If you reinstall an OS on an Apple device, unless it is connected to the computer with which you last synced your device, the data will be erased and at present there is no way around this. This is a big reason why the FBI requires Apple’s help. If the FBI plays around too much, they could wipe the data forever. Only those with the warrant are entitled to use the tool and this seems reasonable to me. The FBI is asking Apple to build a new version of its OS to install on an iPhone that would allow the FBI to bypass the login screen limitations (timeouts, number of tries etc.) and data wiping. Unless I am missing something… As long as only the government has access to this version of iOS AND they have obtained the device in question legally by way of a warrant I am not sure I see this from Apple’s point of view. So here is where I think Apple got it wrong. 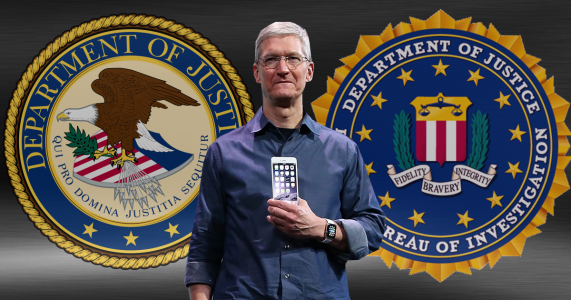 Tim Cook should have written a private letter to the FBI saying one thing. Apple is unaware of anyway to make this happen. A simple ‘we can’t do it’ would have sufficed. Instead a big long open letter to the world has opened Pandora’s Box, so to speak. The FBI is using the All Writs Act of 1789 – Bare in mind I am no lawyer but basically, this reads as a ‘catchall’ the courts in the US can use to force compliance when no other legislation allows them to assert their jurisdiction. They have their mandate but no way to back it up so they use this ‘trump’ card (please pardon the pun). This Act is supposedly allowing the US government to make Apple build this tool for them in the interest of the FBI’s ability to do its job and assert its jurisdiction. So back to the open letter. Complete guess here but this will go in front of another judge and the judge is going to ask this. How does building this OS for the FBI compromise any other device that is not lawfully in the possession of the FBI? Apple has already answered this saying the FBI is asking for access to hundreds of other devices in other cases. So what Apple already admitted they have the technology or can build the technology to make this possible. The cat is already out of the bag. In summary, my take. If the FBI has a warrant for the phone they have a warrant for the information on that phone. That warrant has already passed the sniff test in front of a judge and as I see it, if Apple is admitting they can grant this access but won’t, they are standing on a soapbox trying to change laws. They are entitled to do this, but it doesn’t change the facts or current law as it pertains to this case. So Apple coders brew a pot of coffee, stay up all night long and get this thing built already. 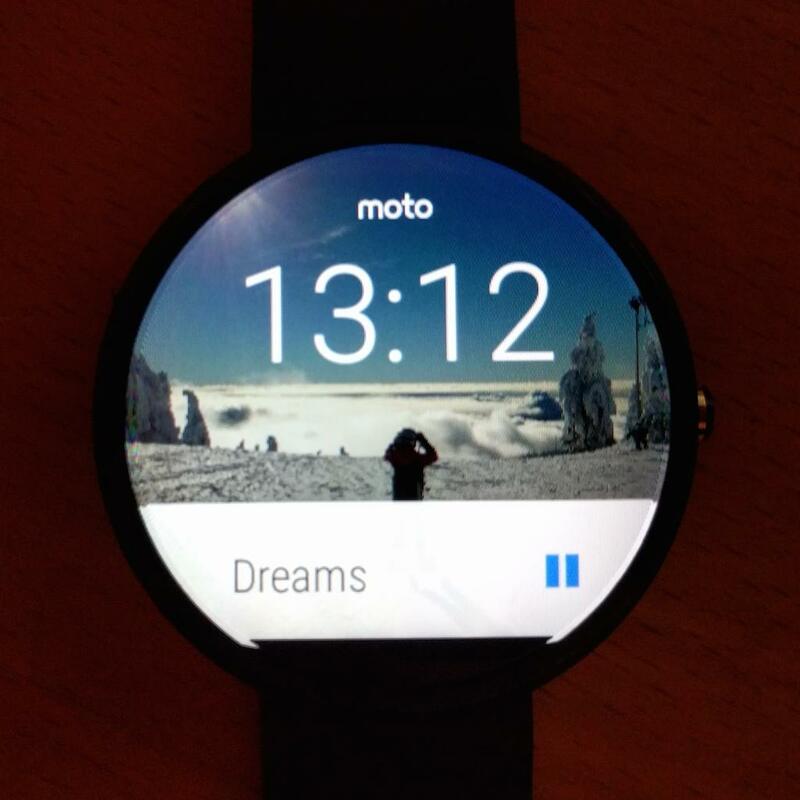 One Year Married to the Moto 360 – Has My life Changed? It has been just over one year since I decided to take the plunge and get a wearable, a Moto 360 to be exact. When I got this watch, I wasn’t 100% sure what to expect but I was in serious need of a replacement for my 10 year old watch and the Moto 360 was about the same size as my old watch so I figured I should try it out. The honeymoon period was great- I just loved the watch. I was finding that I didn’t have to constantly pull my phone out of my pocket to look at notifications. I could also execute quick commands like sending a text message (I have kids that love to text me when I am driving), replying to emails and answering random trivia questions from my kids, all with ease. The speech recognition is fabulous (although it’s the same as my phone but I never got into using it on my smartphone). On a recent trip, I used it to figure out where we were and what how much time we had left (aka are we there yet?). You quickly discover that “OK Google” is awesome even though you do get a few strange looks when you are seen talking into your wrist in public, but when you’re in your honeymoon phase, you don’t care if you’re seen doing it in public. You just do it! I read lots of complaints about battery life but I pick it up from the charger at 6am everyday and by 11pm, it still had ~ 50% of its charge which is better than what my phone could do. There weren’t too many apps specifically written with the Moto 360 in mind; however, one of my favorite apps Stocard did a really nice job with it. I can quickly select the barcode for the cards I need (usually Save On Foods, Scene card, or Air Miles) and get the cashier to scan it on the spot which is usually accompanied with a “I’ve never done that before, that’s cool!” Yes, another favourite saying heard during our honeymoon. Much like with the 7 Stages of Marriage, it didn’t take long for the passion or honeymoon stage to come to an end. For me, it started with the promise of something better. Google released a new version which promised to allow my watch to connect to my phone over wifi instead of bluetooth. This means that I could leave my phone charging in one room but still get my notifications while watching TV in another room. I was really excited about that at first because the phone I had at the time was starting to have battery issues and required more charging. After that install, life was never the same. The bugs, the bugs, the bugs. Arggh!! Where do I start? Suddenly, “OK Google” had less time for me. It kept giving me the “Unable to Connect” error which is the techie equivalent to “I have a headache”. “But I just want to know how tall the Eiffel tower is right now. Not tomorrow! !” The next issue I got, fortunately only a few times, was that the alarms wouldn’t go off. A few times, I setup the alarm for a certain time and that time came and went and no alarm. I was fortunate enough to wake up on my own but now I am always worried that it won’t work. I don’t really want to rely on some exterior help for a basic function like an alarm clock even if I am reminded everyday with a thousand emails how cheap and easy it is to get. Good morning, good morning is how the song goes I think. Rebellion – Don’t Make Me Think! Speaking of alarms, who was the bright person who decided that when you set an alarm, it needs to be set for right this minute? Before the upgrade, when setting an alarm, the watch would remember whatever the last alarm was set to, and it would be offered as the starting point for the next alarm which for most mortals is what they want to do. Now it only takes a few seconds to adjust the wheel to 6:00am the next day so I guess that’s not the end of the world but annoying nonetheless. Finally, once the alarm is set, it would be nice to know that it is so I don’t have to keep asking. Complications is what those things are called according to Apple. Another annoyance that I have learned to live with is how to turn off Theatre Mode. Theatre Mode is a mode you can put your watch into so that when you are in a movie and you move your arm, the watch screen doesn’t turn on and annoy your neighbour. Turning it on is easy, turning if off is now strange. You go to the same screen where you turned it off and everything looks the same as before, so you tap the button to turn it back off. But, what really happened is that by going back to that screen in the first place, the watch automatically turned it off so you end up turning it on again and again. I got as much feedback here as the standard: “nothing’s wrong, honey”. It took me about three times to figure that one out so a little feedback here would have been useful. One of my major annoyances with the UI today (come to think of it, it actually started from day one but I wasn’t really ready to admit it) are those toasts that come halfway up. In most cases, when you have a toast, you can tap up on it to reveal the full details of the notification; however, when you are listening to music, tapping on the toast pauses the music. Pulling up on it brings the notification that is underneath. “But all I want to do is turn up the volume”. It is like that elusive G thing, you know it is there and sometimes you stumble on it but don’t ask me how. There were a lot more bugs that I went through, I don’t know if I just got used to them or because I recently upgraded my phone to a Nexus 5X running Marshmallow, but most bugs seem to have settled down. Well, “OK Google” is sometimes worse and won’t even acknowledge that I exist. Other than that, things are good. Now it has been a year and with a few patches and compromises, I have come to (still) love my Moto 360 for the same reason as I did when I first purchased it. It’s not doing everything that it promised it would do when I first got it, but I still prefer having it as opposed to being single. Probably the biggest advantage is that it just takes a few seconds to filter the many notifications that I get during the day. My phone stays in my pockets and that has helped me reduce my smartphone addiction. Gone are the days of “Oh, I got an email, let’s see who it is from,” take the phone out and look, and then decide to reply to the next one in the list, then why not check facebook while at it … so on. Now I see who it’s from and simply swipe them away much like that barista at Starbucks that keeps flirting with me. Life is good! 2015 has been an action packed technology year. We’ve seen hacks, drones and a lot of hoverboards in flames. Aaron Sorkin couldn’t even get people excited about a Steve Jobs movie (too soon guys, give it a decade) and self driving cars have quickly taking over roads in California for testing. New Apple products made rose gold a thing (but still not fetch), Google became Alphabet in a strange and unnecessary creation of a umbrella corporation which will hopefully make more sense in 2016. Since the end of the year is a wonderful time to make grandiose predictions for the coming year, here goes! Duh, right? They have gotten a lot of press with the recent ruling about mandatory FAA registration and people crashing the drones they got from Santa. These unmanned aircrafts have taken off (ha!) and in 2016 they will really continue to dominate the skies and our fascination. Amazon has been promising parcel delivery by drone for some time now and I have a sneaking suspicion that it will hit critical mass in 2016. I can’t wait for the time that an Amazon drone will appear at my balcony with whatever I’ve impulsively bought because their one click purchase is the devil. There’s even a “No Drone Zone” sign on the Arthur Laing bridge heading to the Vancouver airport. How glamorous of us! Nothing scares people more than the idea of an evil robot taking over and killing or enslaving the human race. Evil robots have been a pop culture fixture for decades and that theme won’t end anytime soon. The uncanny valley is one major hurdle keeping AI from breaking into the mainstream the way it should have by now. Ex-Machina came out in 2015 which I have mentioned MANY times in previous posts but I shall beat that dead horse again. That film was the best AI movie I’ve ever seen because the robots didn’t have an uncanny valley problem, and it quietly illustrated how utterly terrifying AI can/will be due to our hubris. Terminator is unrealistic while Ex-Machina seems like something that we’ll be hearing about next year. Elon Musk and Steve Wozniak has spoken out against AI but their warnings will be ignored. Apple, Google, Facebook and Elon Musk have open sourced all their AI technology so next year we’ll really start to see AI gain momentum. A very clever teenager hacked a CIA Director’s AOL email account, Ashley Madison user data was exposed, Jeeps got hacked on the highway and countless more people got screwed over. Vigilante hacking has also risen to prominence by attacking racist websites, threatening to expose evidence that Making a Murderer’s Steven Avery is innocent and even going after ISIS along with many others. The Sony hack in 2014 opened the floodgates for 2015 and I am very confident that next year will have even more hacks and cyber security breaches. Even Hello Kitty user data was hacked, so apparently kids aren’t even safe. Hacking is coming to the forefront of pop culture again so there will be even more high profile cases than 2015- it offers fame and in some cases, money. There’s nothing more rewarding than being proven correct in your baseless predictions of technology trends! My hatred of hoverboards is well documented and now everyday online I see articles about hoverboards catching on fire. So, so, so many articles. Hoverboards should be sold with fire extinguishers (please forward me all royalty cheques for that brilliant idea) but they continue to sell and I continue to see people rolling down the street on them. Even though becoming a human torch is very likely, I still expect hoverboards to have a knockout year in 2016. Hey, even Russell Crowe and a priest (doesn’t that sound like the punchline to a horrible joke?) got in on the hoverboard action. There’s no stopping these silly devices from rolling into our everyday lives once the battery issues get resolved. They need to all catch on fire and rest in the depths of their fiery hell, but the opposite will happen. I remember when the coloured iMac G3s were first announced in 1998 and desperately wanting one. When the first iPod was released in 2001, the tech world had clearly changed forever. Apple was dominating the industry with their innovative, simple designs and the charismatic Steve Jobs at the helm. I wasn’t interested in technology (shhh, don’t tell 14 Oranges) but I was captivated by Apple’s ability to predict and deliver on consumer trends before we knew we wanted colourful computers and to never use a Sony Discman again. They made non-techies able to appreciate and enjoy technology, which was once the exclusive domain of IT folks. For years Apple was untouchable and the aspirational dream of most tech people. However, I haven’t been excited about anything Apple has announced in years. YEARS! That’s an eternity in technology time (for those who don’t know, tech time is like dog years). Their keynotes and product reveals don’t hold the same surprise and delight that they once did. I don’t watch the livestream anymore or get excited the way I used to. It kills me to have say this, but I predict 2016 won’t be a glorious year for Apple unless there is a dramatic announcement. I’m not saying they’ll be going broke anytime soon, but their stronghold of the consumer tech arena is loosening and next year will be when we really start to notice. Virtual reality is an exciting possibility that humans haven’t gotten correct yet. It helps that LeBron James is training in VR, Google Cardboard and Samsung Gear VR were released and people are becoming more open and curious about the technology. What was once a frontier of weirdness has become more accepted into pop culture as athletes and newspapers are jumping onto the VR bandwagon. Video games and movies are going to be a huge market for VR in 2016 as partnerships between Oculus and 20th Century Fox and some others have been announced. Moviegoers would love to watch a movie in VR because it the possibilities are endless! I can’t wait to experience the excitement of sailing on the Titanic, the terror of huddling in a trench in World War I and watching a gladiator fight (are you not entertained?) in the Roman Coliseum. I think that in 2016, the VR technology will be so much further ahead than it is today that what we have right now will look primitive. My love/hate relationship with wearables has also been well documented, but I still think 2016 will be the year for smartwatches. The Apple Watch flopped because the first gen model did nothing but subsequent updates have made it more useful. Since the Apple Watch came out, I have not seen anyone wearing it on the streets. Not seeing everyone with the latest Apple offering is strange but given how ‘meh’ the watch was, it’s not surprising. Wearables still have a long way to go in order to hit critical mass, however, I think smartwatches will become more common in 2016. Other wearables like Google Glass most likely will flop again, but FitBits and the health side of wearables will continue to grow. *My excitement ranking is based on if I’m looking forward to the occurrence and how much I think it will affect my life (it’s all science). If I never see another hoverboard again, it will be too soon. Those things are moronic and fire hazards- good riddance. The endless possibilities of drones is thrilling for my retail and instant gratification purposes- bring on the drones! Artificial intelligence will rise up murder us all (maybe while riding hoverboards) in the future but in the meantime I wouldn’t say no to a robot butler. If I had any talent with a computer I might consider a career as a professional hacker, however, I am not. Hackers will be the new rock stars but instead of comparing top 40 hits, they’ll be comparing hacks. Virtual reality will be really exciting in the coming year and I can’t wait to get to explore places in VR. VR will be a sort of time travel experience that I think a lot of people are excited for (plus, it won’t murder us). Wearables have a lot of necessary improvements but when they get to a Star Trek level of usefulness then they’ll be on everyone and we won’t look back. and a stylus for an iPaaaaaaaaaaaaaad! I remember getting the first iPhone in 2007 and having people actually follow me on the street just to see it live and in colour. It seemed really strange at the time but it was a sign that technology had dramatically shifted forever. There were some skeptics in the beginning of the era of touchscreen and a non flip phone but Steve Jobs persevered anyways and look where we are now. Ah, first gen iPhone. Were we ever that young? Working out is my personal hell. I despise every second of it so anything that will distract me and make it easier is something I’ll gladly jump on. Smartphones come in handy because I can load it up with horrible music and surf the web while pretending I’m anywhere but on an exercise bike. As much as I adored my old Nokia 8890, my iPhone 6 is so much more useful. My wonderful Nokia was featured in a Backstreet Boys video, it was still rather useless compared to phones of today. Smartphones today all look alike whereas the earlier phones had some personality and differentiating features (and Nokia had the best UI). I enjoy scrolling through Instagram when I’m in a waiting room somewhere or checking up on my shark Einstein to make sure he hasn’t eaten anyone. I can kill hours just surfing the net because it’s the greatest source of entertainment ever and it’s in my pocket. Remember the days (yes, I know how old this makes me sound) when you had to have coins for the parking meter? Dashing inside a store to get change and then running back out to your car to put the money in (in the rain, it was always raining)? Those were NOT the good old days for sure. I love being able to sit in my chair at happy hour and add more money to my parking meter when I get a text from Pay by Phone alerting me that my time is running out. This is the type of technological advancement humanity has been waiting for. This convenience and simplicity makes having a smartphone something I can’t imagine giving up willingly. Another benefit of a smartphone is vast amounts of information at my fingertips. For example, when I’m cooking and I forget what’s needed in a recipe I can just pull it up on my phone and continue without getting the cookbook. Plus, my bookshelves thank me for not being loaded down with things I’ll never read. My old TomTom GPS was great but nothing compared to Google Maps. The simplicity of not needing to pull over and root around in my glovebox for the GPS is something I never thought would be a big deal but after using directions on a smartphone, it’s a touch of convenience that I appreciate. Plus, my old GPS would mysteriously turn on in the glovebox and I’d hear an Australian man’s voice suddenly start talking while I was driving alone and it scared me half to death on several occasions. Ever been stuck in traffic when the venti Starbucks vanilla bean frappuccino with 2 shots of espresso (seriously, try it) you just finished suddenly hits you? I’ve been forced to pull into Le Crocodile (thanks for your hospitality!) and throw the keys at the valet while running into the establishment to use their washroom. Luckily, Charmin has heard my screams and created an app that will show me the nearest washrooms and the cleanest (some even have pictures!). THIS is what technology and smartphones have done to make our lives easier. I’m never giving up my phone because then how will I find the nice washrooms? When I was a university student I had my fair share of car repairs and nothing made them more stressful than being stuck somewhere in the dark, without a phone. With a smartphone however, I can look up VW manuals and find out why the coolant light might be on or what type of oil the car needs. Huzzah! I am now a mechanic! More importantly, I am able to search for the nearest repair shop, check their reviews and make an informed decision. I can use my smartphone to check the weather, read the news, buy Starbucks, turn on my Hue and a million other things. I don’t want to go back to the Dark Ages of cell phones where Snake was the only game that I could play and I was unable to confirm if Aaron Paul, Bryan Cranston and Dean Norris all guest starred in the X-Files (they did!). Being connected all the time means I get to choose when I want to plug in. If I don’t want to answer emails, then I don’t. A smartphone gives me the tools and freedom to decide what I want to do. I prefer having the option of standing in a store and price checking something on amazon.com instead of going home to look online. Smartphones make our lives more seamless. At 14 Oranges, we integrate Facebook with many of our client’s projects so when we heard that Facebook was making an appearance here in Vancouver, we were excited to check it out. fbStart is a new program Facebook is rolling out that encourages Startups and App developers to use their tools. Facebook hosted an evening event last Tuesday at The Hive downtown to share some information about the latest and greatest of their offerings and how app developers and startups can benefit from taking part. Facebook sent up around 7 Facebook employees from Seattle and the Bay Area which included a range of engineers and managers. One of the staffers asked me about my ‘little red flower’ (snerk – kirsten) as she noticed lots of people wearing them and since she’s not from Canada, had no idea what they were for (this makes me want to watch Saving Private Ryan – kirsten). Matt went on to discuss the Facebook SDK and specifically some of the newer features. These features include: a sharing dialog via the native FB app, a message dialog via native FB Messenger app and FB login plus its use in your apps. One of the more interesting parts to this topic were the ideas Matt presented on growing your app. Matt talked about deep linking back to your app from ads ensuring you target specific audiences to specific areas of the app. Another topic that was definitely of interest to the startups in the room was advertising through Facebook. Matt recommended using using a video or a series of photos because they drive more conversions. The room got excited when they mentioned FREE Facebook ad credits when you get accepted to the FbStart program. Matt went on to discuss some more detail on Facebook Ads, specifically focusing on how advertisers can create custom audiences though very specific targeting of truly accurate demographics. Matt handed the mic over to another Facebooker, this time an expert in the Facebook analytics platform. One of the most interesting and slightly scary things I learned at this presentation was that if you have the Facebook app installed on your device, app developers can track user demographics (that’s normal – kirsten). The user data is anonymous to the developers but the very detailed demographics information available to the developers can allow them to create very targeted ads or content. Facebook advertisers can then create a custom lookalike audience using analytic statistics for testing purposes. Most of the other analytic features seemed very similar to Google Analytics and aren’t really worth delving into. Matt was back at the mike for the Q&A section which actually was one of the most enjoyable parts of the evening. During the mingling portion, there was an informal Q&A session as well, which gave us all a chance to ask some more detailed questions and schmooze with him. Please enjoy a few paraphrased highlights of the Q&A session. Overall I feel like the fbStart program was a good idea and Facebook was on the right track taking it to the streets so to speak. That being said, the presentation itself just didn’t have the required substance or detail to make it the hugely successful event that it could have been. Facebook advertised Parse in its intro to this event but there was no mention of it and when a question was asked about Parse, they simply shrugged it off saying they didn’t have anyone from Parse there. Strange, because that’s part of the reason I attended. I felt like I got a salad course with the promise of dessert, but someone forgot to include the steak and potatoes. Fingers crossed they improve the presentation for the next cities because there’s a lot of value in the content. *Start the video at 3:18 to see Shane and Sasan’s grad photos! Ever since I watched Star Trek: The Next Generation as a kid, I expected flying cars and teleportation to be real when I grew up. Some of the wearables and gadgets used on Star Trek have vaguely shaped the technology we use today, but not to the extent my 9 year old heart hoped for. Wearables have long been promised as the breakthrough technology that will really change how humanity interacts, but I think some major changes are needed before that happens. Since I don’t know much about technology, but I do know a lot about complaining, I have outlined my thoughts on how wearables should improve. Apple and Google R&D, please form an orderly queue. Today’s wearable tech can be rather intrusive and not have enough integration into your daily life. Google Glass makes you look crazy so for wearable tech to become more mainstream, it needs to get smaller. I want wearable tech that I don’t even know is there like an outfit I can control with my iPhone or a ring that will notify me with important updates so I don’t need to have my phone out. The main purpose for wearable tech is to be seamless and fit in your life. Siri: Hello Kirsten, what can I do for you? I want my wearable tech (Siri, I’m looking at you) to be intuitive enough to not be tripped up because my timing was off by 2.5 seconds. I want wearables to have the capacity to learn (I know this puts us into scary Ex-Machina or Black Mirror territory) and evolve with my patterns and behaviours. In my fantasy world, Siri will know that when I’m driving outside of a 10 minute radius from my house that I’m probably lost and so she’s ready to direct me home or to the nearest Starbucks. I’m hoping the new 3D Touch will have solve some of my Siri induced rage but we shall see. The Internet of Things excites me because of the possibilities to be the most slothful person on earth are endless. I have a Philips Hue and a Roomba that I ADORE and they are best household items I’ve ever owned. To really take the internet of things to the next level, I want everything to be seamlessly connected with my wearables- Hue to automatically turn off the lights when I go to bed and Roomba to know the floor is dirty and clean it. The new app controlled Roomba excites me but my main Roomba complaint is that you have to pick everything off the floor otherwise it will be eaten (seriously, everything needs to be off the floor or you’ll come home to a sad beeping Roomba with something tangled in its brushes). My mom and brother have Nest but I haven’t gotten one yet and it’s killing me. Since the weather in Vancouver is just rain and we don’t get the extreme cold that the rest of Canada gets, I won’t know the delight of having a heated apartment when I walk in the door. However, my brother (Hi Colin!) lives in Ohio so having an apartment that isn’t subarctic when he comes home is a treat (Colin also has an automatic starter for his car which is I am super jealous of). I want my home to be connected in a smart, seamless way to my wearable technology that makes sense and is tailored to my habits and lifestyle. When I’m home, my Apple Watch should communicate to the Nest or Hue without me having to touch a button. Wearables being connected to the things around us needs to be the next frontier of travel and maps. Last fall when I visited Versailles (how douchey was that sentence?) I waited in line for entry, then again to get a translator ear piece thing because my French isn’t that good anymore. I abhor waiting in line so if I could have had a wearable device that would have picked up that I was standing in front of a painting of Marie Antoinette holding court and told me about it, I would have paid money for that. If you’re lost in a foreign country, useful, intelligent proximity features would completely revolutionize the travel industry and make wearable devices more mainstream. No matter the technical advancement, there’s a little part of me that’s suspicious of where my information is going and who can access it. With recent hacks and privacy breaches in the news, it’s not unfounded that people would be worried about the latest wearable tech which collects more personal information about you than your bank. There was a guy in the news who’s FitBit was used against him in court for a personal injury lawsuit so there is reason to be careful with what you’re doing. However, I try not to be an alarmist so I usually just try to get over myself. I only recently added a password to my iPhone so I’m probably not the most secure user of technology. There’s still a long way to go to get many consumers on board with having a device that monitors your most personal details. There are tons of benefits to FitBits and other wearables but you still exercise (ha!) caution. Wearable technology seems to be one of those buzzwords that seems great in theory but hasn’t really panned out in real life. I was super jazzed about the Apple Watch when it came out but as I complained about before, it was useless. If people are expected to leap at every new Apple or Android offering, the wearable technology needs to be seamless and make our lives easier. I don’t want to have an aneurysm screaming at Siri when I’m lost after making a wrong turn (yes, I know I should just learn directions). I want Siri to learn that I always say the full command instead of waiting for her acknowledgment, so she should adjust to my habits. Hue should be connected to a smartwatch and know I’m falling asleep on the sofa watching Frasier and either turn the lights off or turn them brighter if I tell it ‘don’t let me fall asleep.’ These little details are the make or break points needed for wearable technology to really gain momentum in the consumer sphere. Currently I have a super cool light system that lets me choose any colour I want and control it with my phone, but aside from my brother, no one I know owns one. Every time people come over they LOVE checking out the colours on Hue or watching Roomba but no one has actually made the leap to buy either one. I want the world that Star Trek promised me! The digital business environment is incredibly competitive, so organizations rely heavily on cost cutting measures to affect their bottom lines. With engineering costs of application development ever increasing, offshoring technical work can look like an attractive option for many corporations in Seattle and Portland. However, offshoring presents many challenges such as language barriers, time zones and cultural differences that can easily cost a business more in the long run. Instead of spending money offshore, companies in Portland and Seattle should be taking advantage of the nearshoring opportunities and knowledge capital just across the border in Vancouver, BC. The value of the Canadian Dollar is great news for American companies providing a real opportunity. The talent pool north of the border is world class and currently deeply discounted at upwards of 25%. Analysts are predicting that the Canadian dollar will remain low for the rest of the year and into 2016. For a company located in Seattle or Portland, nearshoring to Vancouver is a logical way to maximize value and efficiency. Vancouver, BC shares the same time zone which allows for very easy collaboration and rapid response times. For example, if there’s a bug, it’s easy to simply pick up the phone and call the Vancouver team instead of waiting for a response from a developer many time zones away in India or China. At first it may appear that the per hour rate for offshore developers is cheaper, but the turnover rates are incredibly high and quality issues stemming from miscommunication regularly push this hourly rate higher and higher. Also, if onsite work or collaboration is required, travel from Vancouver to Portland or Seattle is incredibly fast, simple and cost effective. For example, our Seattle based client Arris scheduled an in-person meeting at their office. Sylvain was able to drop his children off at school in the morning, drive to Seattle for the meeting and make it back home in time for dinner. Proximity allows both parties to operate in real time and communicate face to face whenever it’s necessary. The cultural business landscape along the US-Canadian border is virtually identical; therefore, communication and understanding between organizations will not be impeded by language differences, learning curves or growing pains. Speaking the same language may seem like an insignificant detail, but when phone and email are the primary methods of communication, language is critical. Existing expectations for how business is conducted will lead to better working relationships and a similar understanding of issues because Vancouver is aware of the political, cultural and social landscape of the West Coast. This understanding is intangible and cannot be taught to companies overseas because it is implicit. It bears reminding that with NAFTA, US companies nearshoring to Canada can rest easy knowing their intellectual property is respected and will remain private. For some companies that have engaged in offshoring, once they have paid their bill, they had no idea the fate of their documents and proprietary information. As such, nearshoring to Vancouver reduces risk and will save you money on legal fees and the hassle of determining where your intellectual property has ended up. The allure of offshoring can be tempting to organizations looking for a quick fix to cost savings; however, it is a short term solution. Offshoring saddles companies with long term risks and headaches which could be easily avoided by choosing nearshoring to Vancouver. For a fraction of the price, American companies can take advantage of the incredible technical talent pool available in Vancouver. Our talent understands the West Coast culture and professional expectations that will eliminate miscommunications and allow you to get down to business. When it comes to technical work, proximity is key. If business travel is required, Vancouver is just a one hour plane ride to Portland and the same time zone which makes conference calls and emails easy to execute in real time. As the digital transformation continues, more and more American companies will nearshore development work to Vancouver to capitalize on the cost savings and operational efficiencies.